Destination weddings are fun and exciting no matter where in the world they take place. When families and friends spend several days together in a beautiful vacation spot, lots of laughs and great memories are sure to follow! 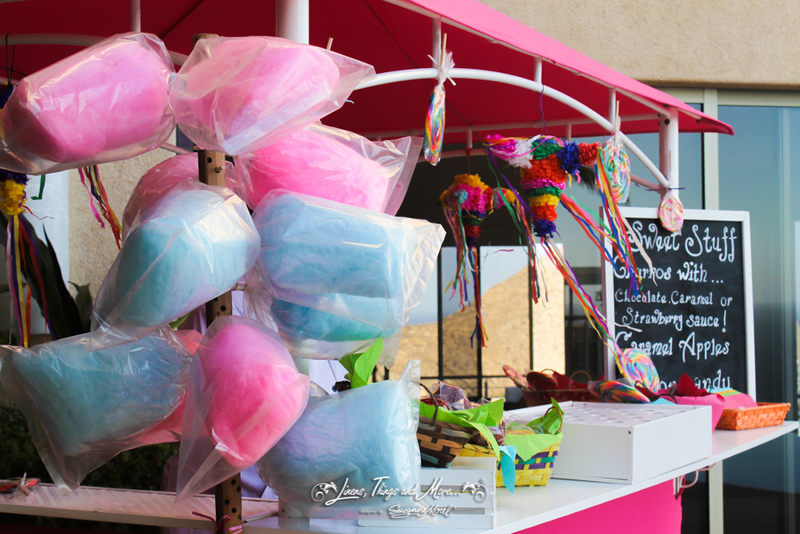 For destination weddings in Mexico, many couples want to incorporate a fun, colorful theme throughout their décor. Our décor design team loves this style, and since we are in Mexico there are endless options for embracing the flavor of Mexico with your wedding décor! 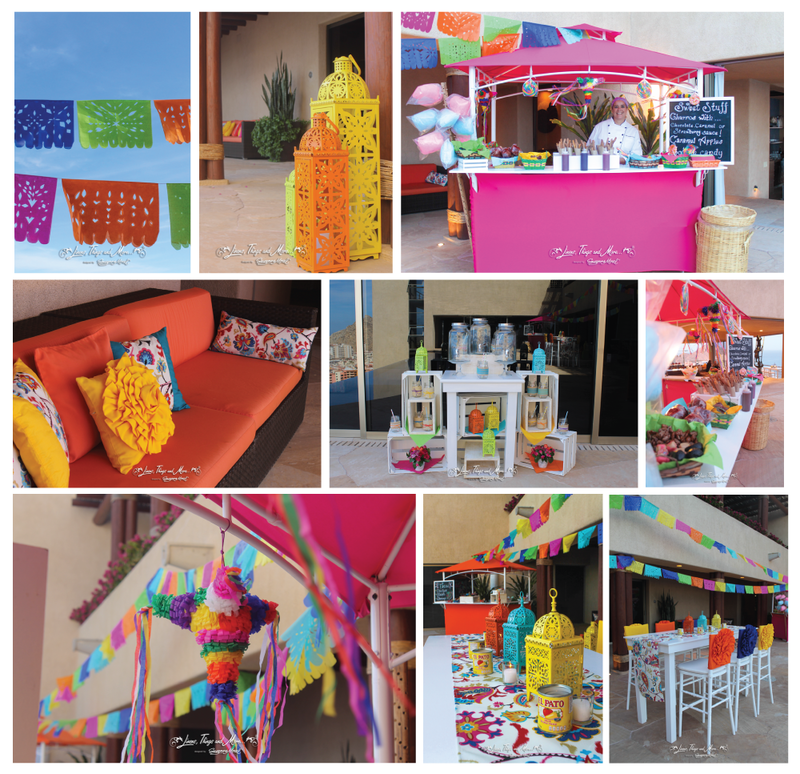 We recently designed Mexican décor collections for a couple of different events, and we are proud to show you some of the ways you can get inspired by the vibrant colors and traditional details of Mexico! 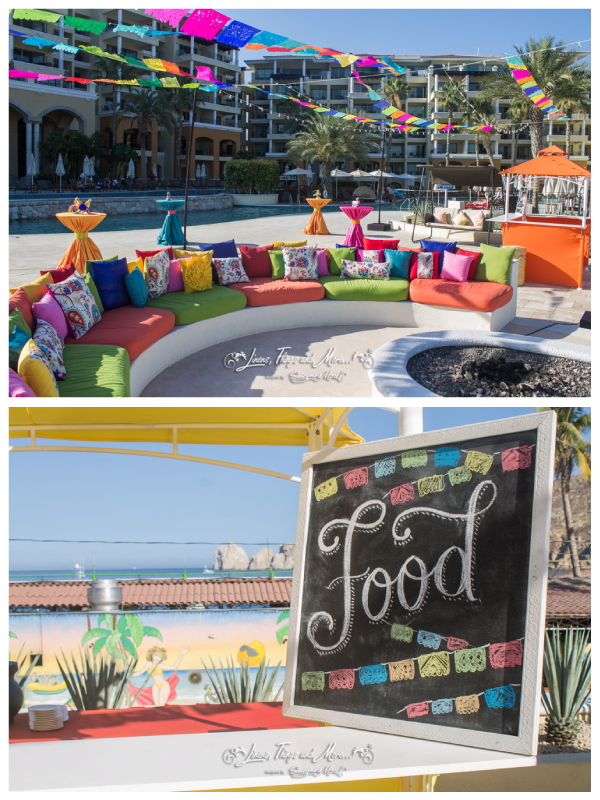 These brightly colored cocktail tables, custom lounge pillows and papel picado streamers were all designed for the rehearsal of Kylee and Brandon at Casa Dorada. Our design team added a colorful piñata as table décor, and even recreated the papel picado look on the chalkboard food sign! Again, no detail is too small, as we incorporated a woven wastepaper bin so as not to distract from the décor with a regular trash bin. A colorful Mexican design is also the perfect décor look for a dinner party, as you can see from this private villa set-up with Creative Destination Events. 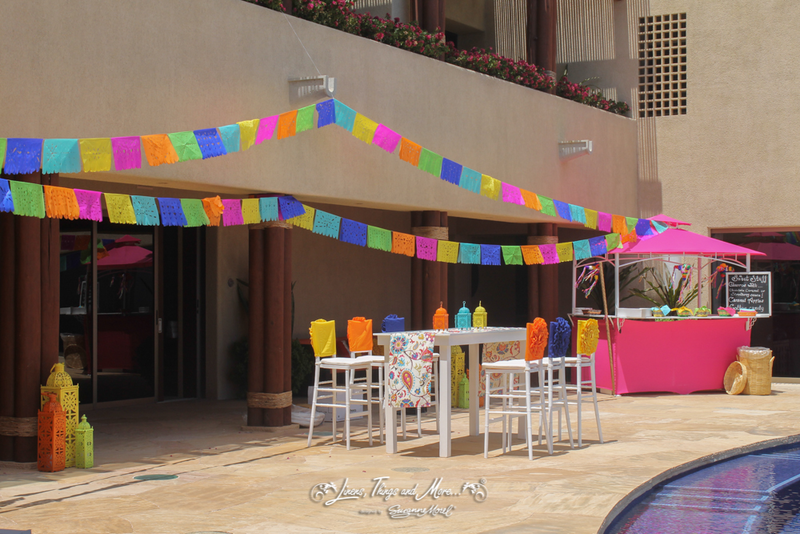 Colorful lanterns, hanging piñatas and a Mexican-themed dessert station all added up to one fun celebration! The special chair jackets, unique table runner and all the lively food stations made this “Mexican Street Fair” a big hit with the party guests! 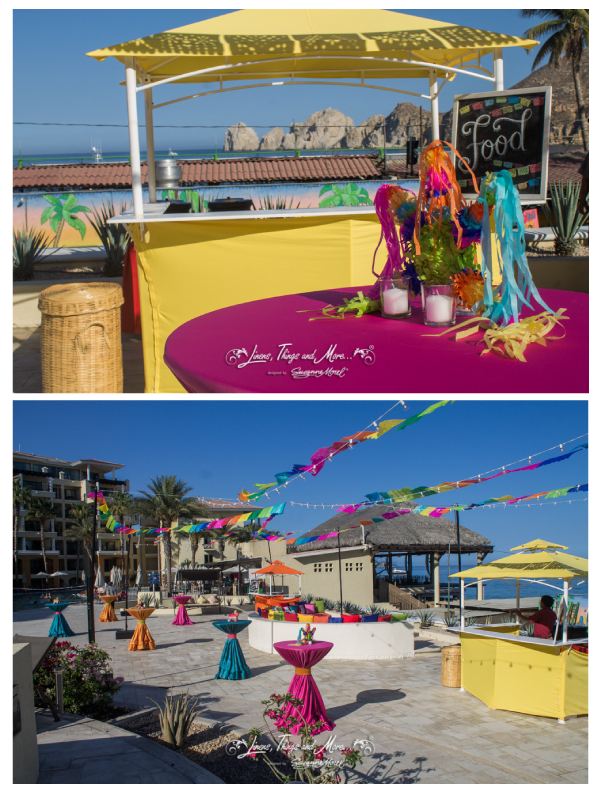 The design team at Linens, Things and More… is ready and waiting to add as much (or as little) Mexican flair as you wish to your destination event in Los Cabos! Contact us today to see just how fun and exciting your very own destination celebration can be! This entry was posted in Accessories and decor, Cabo event design and decor, Special Event Decor in Cabo, Weddings and corporate events decor and tagged cabo wedding ideas, COLORFUL MEXICAN WEDDING DECOR, destination wedding Cabo, destination wedding decor, destination wedding ideas, destination wedding Mexico, event rentals in Cabo, flavors of Mexico, fun wedding decor, Mexican event decor, Mexican party decor, Mexican style wedding, Mexican wedding decor, Mexican wedding pinata, Mexico wedding decor, papel picado wedding decor, party rentals in Cabo, rehearsal dinner decor, vibrant wedding colors, welcome dinner decor.